Anytimefitness.com Official Blogs and workouts! FRN2 CHANT: Mad Hatters vs Rad Cats! Mud Rebels Summer Youth Camp! Order a Custom Rebel Shirt! Click on the photo of the workout to download the workout itself, the exercise reference guide, and a workout tracking sheet! It’s that time of the challenge to revisit your upper body on your own! With a few more exercises as well as new challenging movements I expect y’all to do what Rebels do best…. Dig deep! Click HERE for the previous 8 “On Your Own” workouts! Cable Cross-Overs – Make sure the cable pulleys have the isolated hand grips set on them. Then make sure the cables are set evenly slightly above shoulder level. From here you are going to take 2 steps forward with the cable handles in front of you while getting set in a cable press position (one foot in front while balancing on the toe of your back foot). Since the cables are set slightly above you that means you want to press slightly downward to keep the trajectory even. As you extend and your arms in the “pressing” position you are going to cross one arm over before going back to the starting position, pressing again, and alternating which hand is over the other. 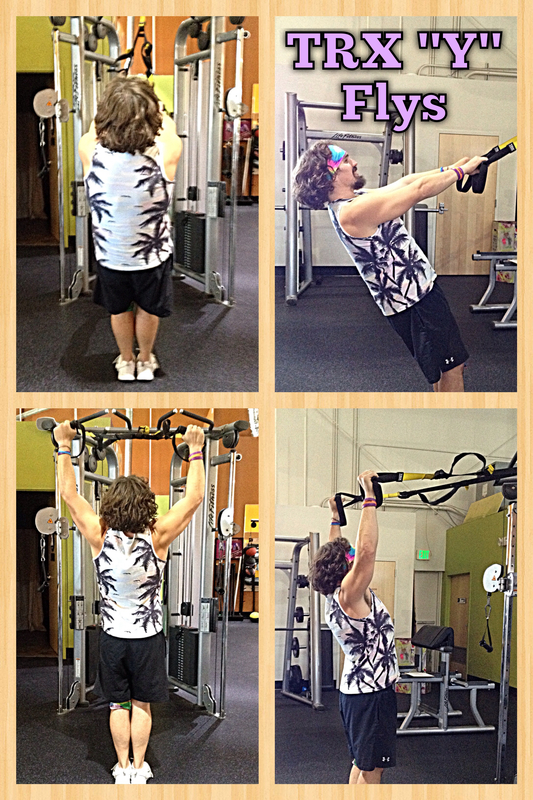 TRX “Y” Flys – Find a spot to hang a TRX and grab the lengthened handles while facing the direction in which your TRX is anchored. With your arms fully extended lean back slightly. The farther your feet are forward the harder this exercise will be. Once in a comfortable position you are going to keep your arms extended while you pull your body forward and bring your arms overhead, focusing on a squeeze in the shoulders and back. Control yourself on the way back down and repeat! Remember to keep CONSTANT tension on the TRX ropes, never letting any slack on it for the duration of the exercise! 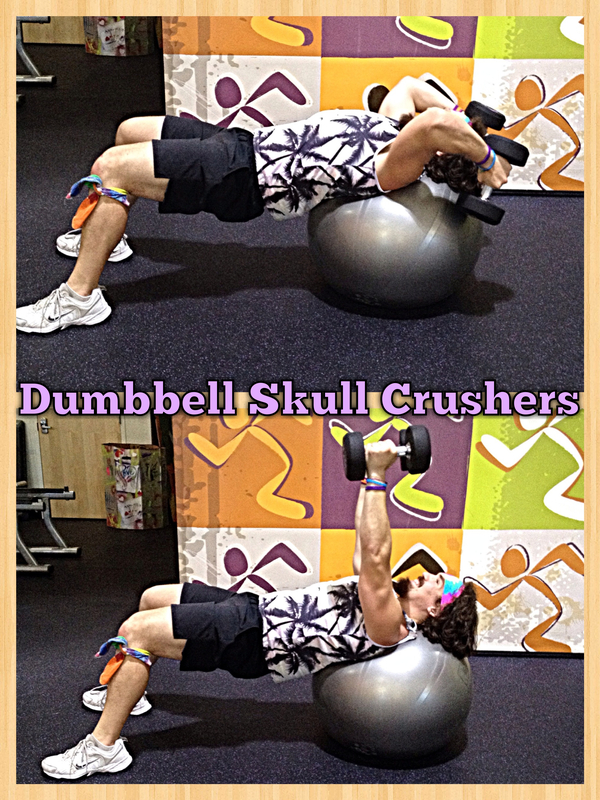 Stability Ball Skull Crushers w/ Dumbbells – Grab a stability ball and choose a pair of dumbbells you feel comfortable doing this exercise with (a little goes a long way!). Starting out seated on the ball you’re going to roll your feet forward until your neck is supported. From here you are going to extend your arms up keeping your dumbbells above your shoulders. B ending at the elbows while keeping them relatively stationary you want to bring the dumbbells toward the top of your head, stretching the back of your arm out. Squeeze the back of your arm while going back to the starting position and repeat! 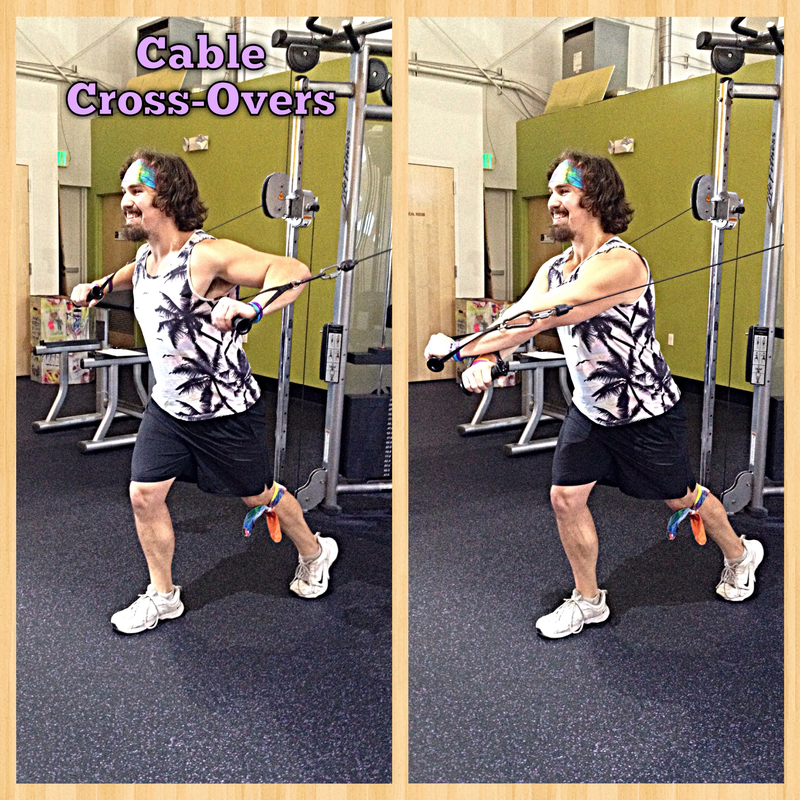 Upright Cable Pull-Overs – Make your way to the cable row machine; make sure the isolated hand grips are attached to the pulleys and select an appropriate weight (a little goes a long way!). Next, place your feet on the CENTER platform as opposed to the 2 outer pedals. With your arms extended push the handles down towards your hips and pull them back behind you squeezing your back muscles in the process. Control on the way back to the starting position and repeat! 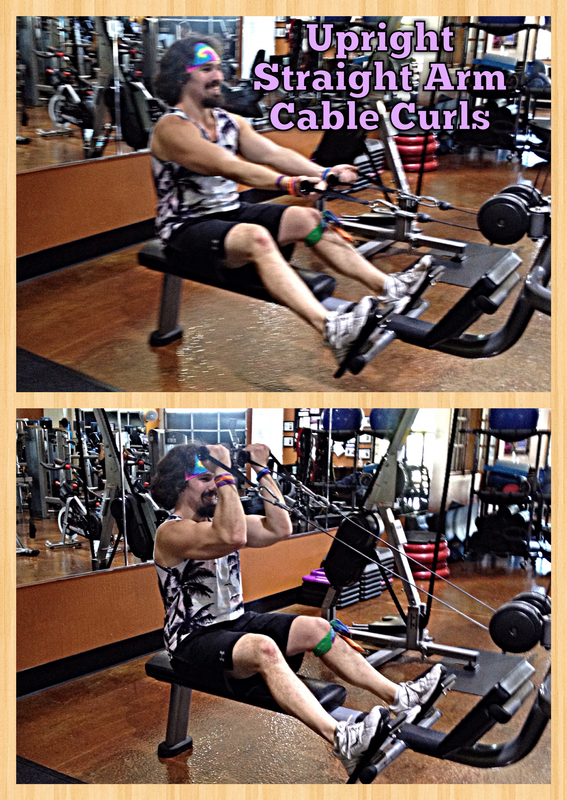 Upright Straight Arm Cable Curls – Set yourself up on the cable row bench with the isolated hand grips and get in position like you’re going to do a row. With your arms fully extended and palms facing upward you want to keep your elbows stationary at shoulder height as you curl the handles towards your forehead. Control on the way back down, be sure to stretch all the way out, and repeat! 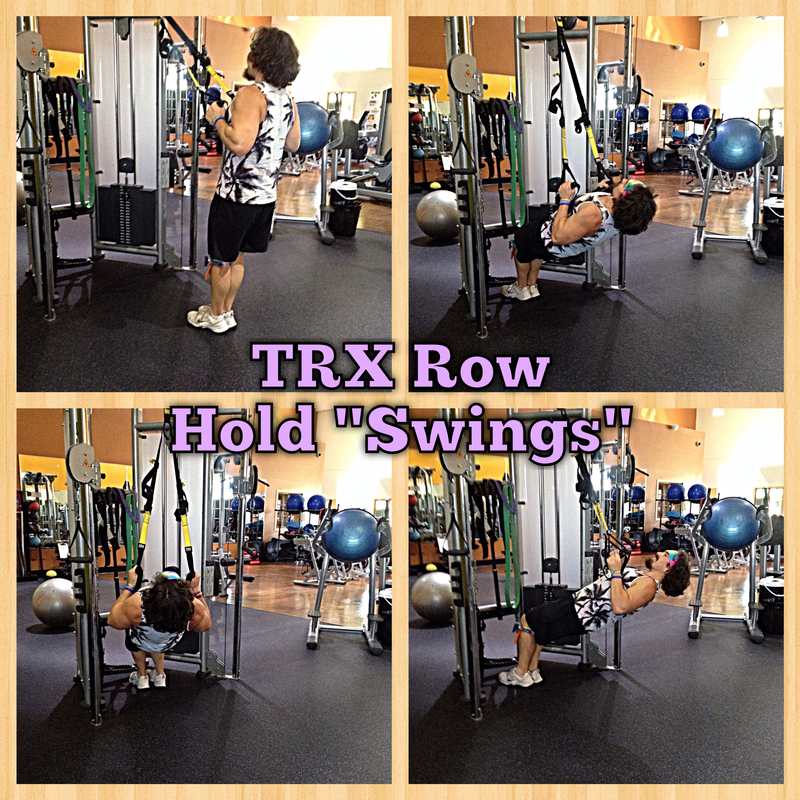 TRX Row Hold “Swings” – Setting a TRX up high you want to make sure the handles are all the way shortened by pressing the black buckle and pulling the yellow tab all the way to the top on each side. From here grab the handles, walk into them, and make sure there is still tension on the TRX. Keeping your arms tucked in walk forward until it is challenging to hold the position you’re in but doable. Once you’re set swing as far to the left as you can (with control) then swing as far to the right as you can (again with control!). Each side you swing to is one rep. 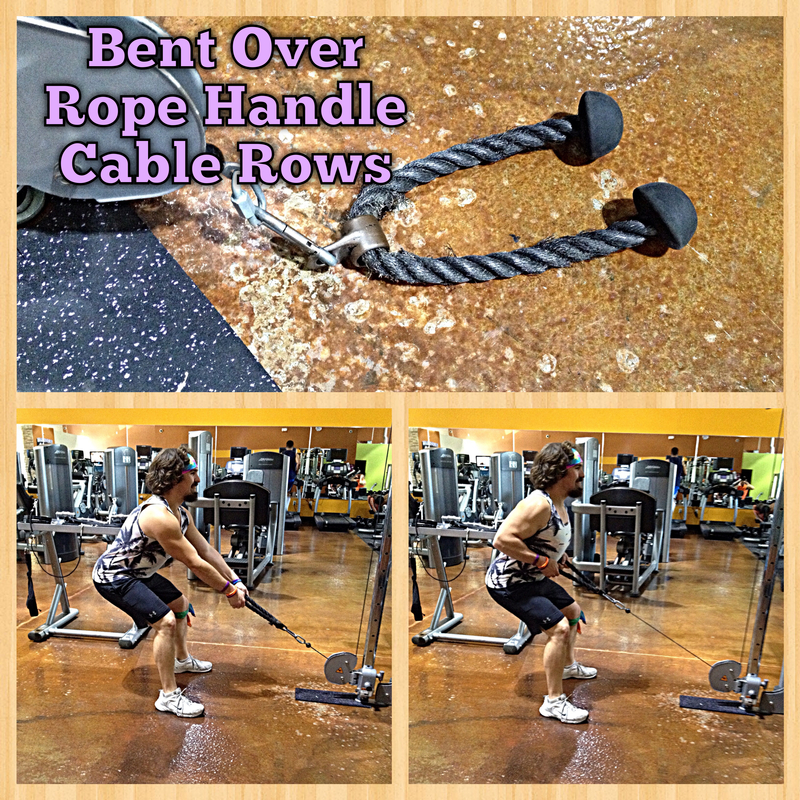 Bent Over Rope Handle Cable Rows – Find a cable pulley system, attach the rope handle, and make sure it’s dropped all the way to the ground. Select your desired weight, grab the handles, and take 2 steps backwards so that you can lean forward and still have tension on the cable. Starting with your arms fully extended you want to keep your chest out and head up the entire time as you pull the ropes towards your body. Remember to squeeze your back and NOT to bend your wrists as you pull. Make sure to get a full stretch as you go back to the starting position and repeat! 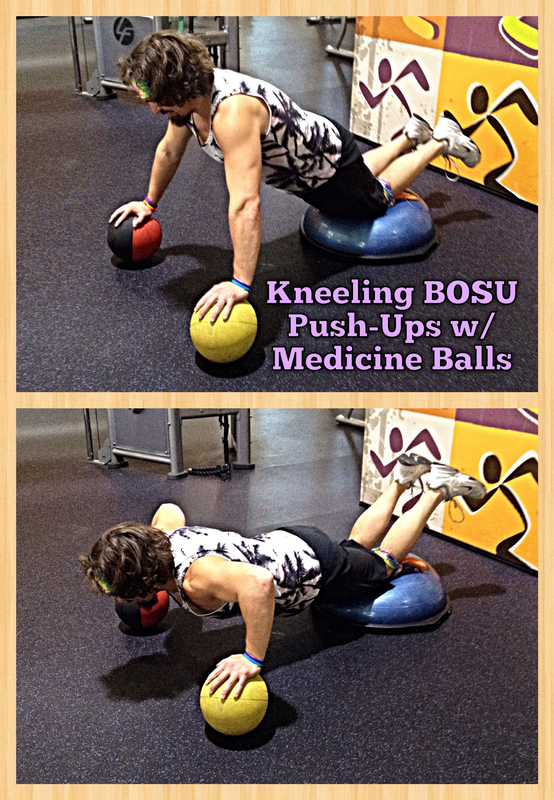 Kneeling BOSU Push-Ups w/ Medicine Balls – Place a BOSU on the ground with the blue side facing up. Next, make sure you have 2 medicine balls in front of you ready to be used as handles (if the medicine balls hurt your wrists then please forgo them). Keeping your balance and utilizing the medicine balls to get a full stretch you want to go down as far as you can in a push-up to the point where you can still come back up. Remember to bring your hips down towards the floor with you! Get a full extension back at the top and repeat! 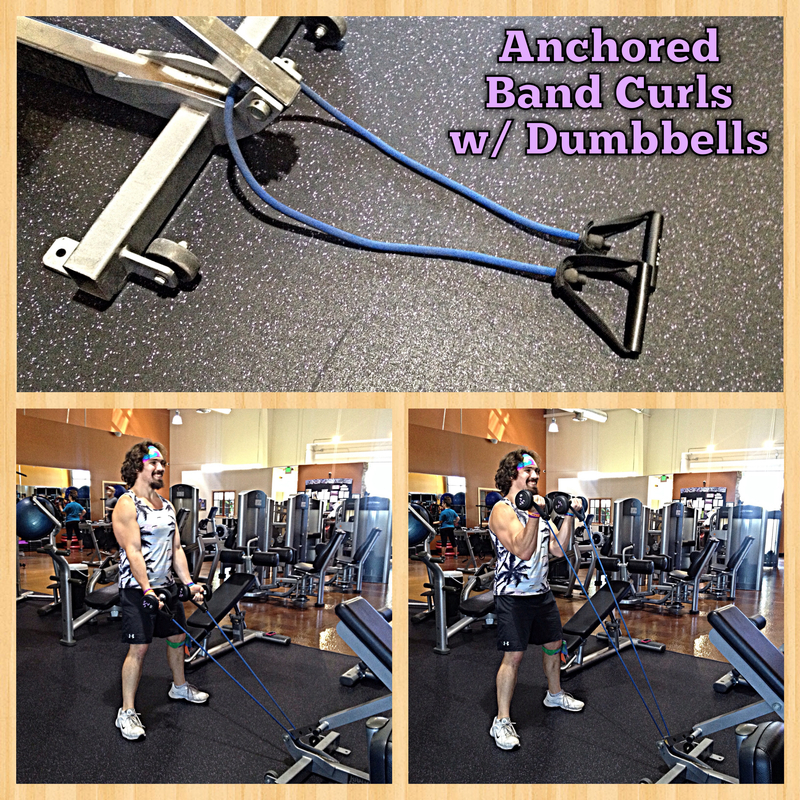 Anchored Band Curls w/ Dumbbells – Find a place to anchor a band of your choice (benches work wonderfully) and select your desired dumbbell weight for this exercise. 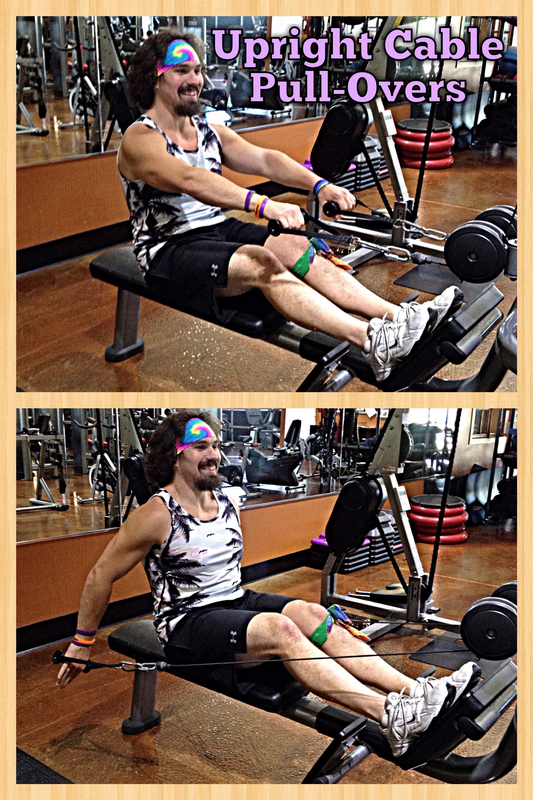 You are going to grab the handles of the band WHILE holding your dumbbells (crazy, I know!) and take 2 steps back so that there is a good amount of tension on the band at all times. Once in position curl the dumbbells as high up as you can in an upper cut fashion, stretch them all the way back down again after, and repeat! 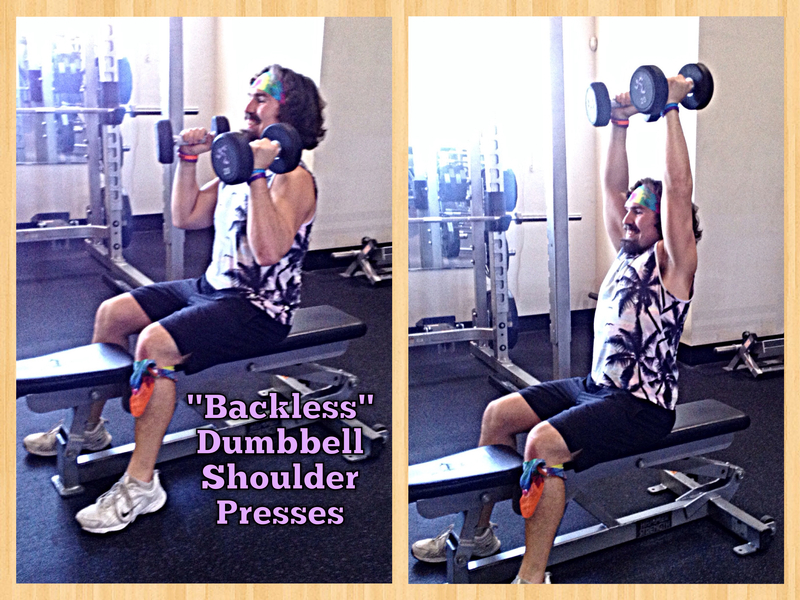 Seated “Backless” Shoulder Press w/ Dumbbells – Grab 2 dumbbells of your choice and take a seat on a flat bench (picking a bench without back support makes your core/back muscles work harder and cohesively). Bring the dumbbells up to your shoulders and from there extend them as high up as possible while keeping your palms facing each other every step of the way. Control on the way back down, keep your abs tight the entire time, and repeat! Sign up to follow the Rebellion! Enter your e-mail address to automatically get updated the second news of the rebellion is yelled out! Rebel Equinox – Sign-Up Now! New Transformation Challenge… Rebel Results!